We’ve been hard at work these past few months on a major update to RBCommons. This update brings all the many improvements found in the latest version of Review Board. RBCommons has a new improved look. We’ve modernized the look, polishing things here and there, bringing a much fresher feel to the service. Don’t worry, though, you won’t have to relearn anything. We’ve kept everything familiar. Along with the new look is support for mobile! You can now use RBCommons from the phone, letting you catch up on reviews and new changes while on the go. Mobile diff review isn’t there yet, but is something we hope to bring down the road. It’s easier now to stay on top of the review requests that really need your attention. By archiving/muting review requests, you can take control over your dashboard and help you get to Inbox Zero (or maybe Dashboard Zero). Review requests can be archived, hiding them from the dashboard until there’s new activity. They can also be muted, hiding them completely from the dashboard until you opt into seeing them. Learn more about archiving and muting. When you’re making a small change on a review request or clarifying something small on a reply, sometimes you don’t want another e-mail to go out to your team. We’re all busy, and every e-mail we add is one more thing to look at. RBCommons allows for trivial publishes of review requests and replies. The green draft banner for review requests and replies contains a “Send E-Mail” checkbox, checked by default. To prevent sending an e-mail to your team, just uncheck it before hitting “Publish”. Learn more about trivial publishing. Ever want to see just a bit more of a diff when reading a review, without having to jump into the diff viewer? Now you can! Just hover over the little snippet of the diff to see the new expansion controls. From there, you can start exploring more of the diff, without ever having to leave the page. Thumbnails now show more of the content you want to see. They’re no longer just tiny previews of a file. Now they’re big and vibrant, and come to life when you hover the mouse over them, scrolling through the file to show you even more. Learn more about Live HD thumbnails. RBCommons now tracks every revision of a file you upload. Make a change to a graphic, or a PDF document? Simply update the existing file attachment by hovering over the thumbnail and choosing “Update.” Reviewers will be able to go view any revision, and for some files, they can even diff between them! Hey, we were just talking about this! Image and text file attachments with multiple revisions can now be diffed. You’re seeing one example of this here, with a split diff of two images. Image diffs make it easy to see how a graphic has changed over the revisions. You can view this in several different modes: Two-Up, Difference, Split, or Onion Skin modes. Text files can be diffed as well, and this works exactly like the diff viewer. Working with Markdown? Now only can we diff the source text, but the rendered output as well! Learn more about diffing file attachments. Got a review group or two that you’d like everyone to be a part of, automatically? We’ve got a new option for that! Pull up the settings for a review group and toggle “Add new users by default.” Any new user you invite to your team will be automatically added to the group. Bitbucket users, rejoice! 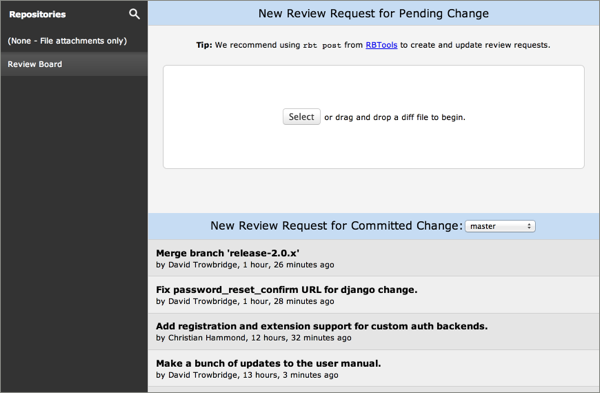 You can now browse for commits in the New Review Request page. If you work in a “post-commit” model, where you push commits and then post for review, you’ll find your workflow’s just gotten a lot easier. RBCommons can now talk to third-party services and scripts through WebHooks. WebHooks are used to notify HTTP services on certain actions (new review requests or updates, new reviews, new replies, etc.). You can use this to interface with in-house tools in response to new diffs or discussions, forwarding them on to other services or automating code reviews. If you’re working with scripts or services that need to talk to Review Board, you can now create API Tokens and hand those out, instead of handing out a password. These are safer, and have the added benefit of letting you limit what can be done in that API session. Learn more about API Tokens. There’s a lot more, but those are the main feature updates. We hope you’ll like the new RBCommons. We know we’ve been looking forward to using it for a long time now. If you have any questions or hit any problems, you can reach out to us through the “Need help?” button (bottom-right of any page on RBCommons), or e-mail us at support@beanbaginc.com. We’re introducing a few new special user permissions, designed to give users a subset of an administrator’s abilities. These can all be set in the Team Administration page by clicking the pencil icon next to team member. The first permission, “Can close or reopen review requests from other users,” enables a user to help keep the list of review requests tidy by toggling whether a review request is currently open. If you’re not auto-closing review requests, if you have review requests open from former team members, or if you’re managing an open source project on RBCommons, this can be quite handy. The second permission, “Can edit review requests from other users,” allows a user to modify a review request on someone else’s behalf. They can upload diffs, edit fields, and so on. The changes currently appear as if they’re from the owner of the review request. The final permission, “Can post review requests as other users,” is most useful for scripts. In cooperation with RBTools (using rbt post –submit-as), a script can post a review request on another user’s behalf, perhaps when a change is committed to a special branch, or after a sandbox operation passes. We’ve been piloting these permissions with some projects for a while now. Please let us know how they work for you, and if you have any questions or problems. Tonight, we’ve released a huge set of bug fixes and feature improvements for RBCommons that should improve your code review experience. We’ve fine-tuned many parts of RBCommons to give you a faster experience. Editing Markdown text should now feel as fast as editing plain text. The lag that would sometimes appear has been fixed. The dashboard now loads a lot faster when using the People, Groups, or To Me columns. We’ve also improved performance in our API. RBTools and various operations on the site should be much faster now. Markdown is now completely optional. By default, all text fields on review requests and comments on reviews will be in Markdown mode, as before. However, you’ll now be able to turn off Markdown while editing, saving as plain text. Note that if Markdown is enabled by default, then all fields will start off editing in Markdown mode. Any plain text will be escaped first. Along with this, we’ve fixed a number of escaping and rendering problems with Markdown text, particularly for text coming from a commit. The diff viewer now supports selecting and copying the text within either column in the diff viewer, without that selection covering code from the other column. Previously, selecting worked like it did for any table in a web page, in that the selection would span both columns, making it impossible to get the text out cleanly. With this new support, you can safely copy a block of text from the original or modified file and paste it into your editor. We’ve reduced how much e-mail you’ll receive in certain cases. For instance, if a review request is updated to add new reviewers, without altering any other fields or introducing a new diff, only the new reviewers will be notified of the update. We’ve fixed nearly 40 bugs across the site, covering issues with repository compatibility, diff generation, usability, e-mail notifications, and more. 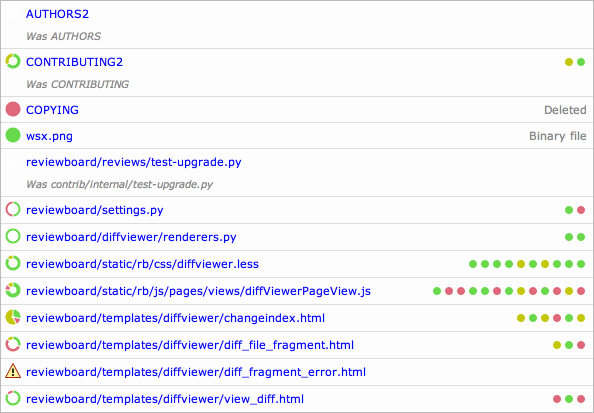 We’ve launched a new feature today for simplifying your code review workflow. If you’re using GitHub, Bitbucket, or Google Code, RBCommons can now automatically close your review requests when you push your commits to your repository, making use of the service’s “post-commit” hooks. You’ll no longer need to click Close -> Submitted, saving time and keeping your dashboard clean. Just commit, and your review request will be automatically closed, along with a message containing the commit revision and which branch it was committed to. Setup depends on which service you’re using for your repositories, but we’ve worked to make it pretty simple. 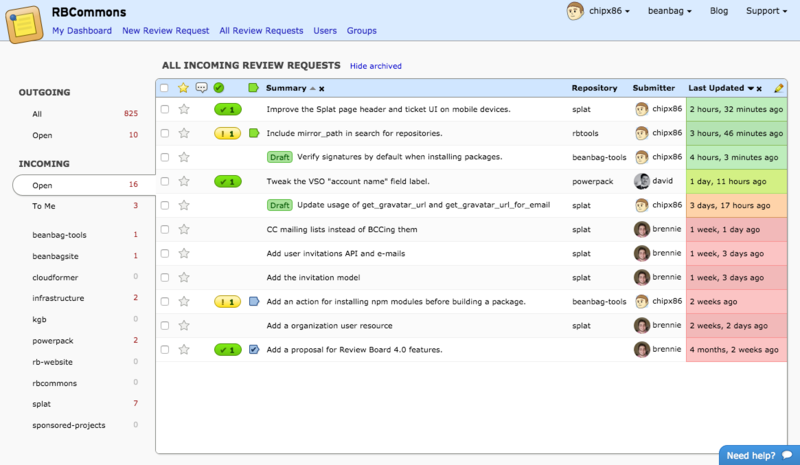 We’ve added some new buttons to your Team Administration -> Repositories page. You’ll see a “Hooks” button next to any supported repository. Click that, and you’ll see instructions on turning this feature on for your repository. In just seconds, your repository will be set up! This feature is still new, but has been undergoing testing for several weeks. If you hit any snags, let us know and we’ll help get you going. We’d like to give an overview of how all this is affecting RBCommons and, in turn, you. We keep a close eye on all security updates available for the software and libraries we use, and are quick to patch our servers as fixes roll out. We’ve also performed many tests to ensure that malicious Shellshock HTTP requests do not impact us. Your data is safe. Some of the services we use were affected by the mandatory AWS and Rackspace reboots. Earlier today, our mail provider, Mailgun, was temporarily down during the outage, which may have resulted in missing or delayed e-mails for those working on Sunday. We’ve had a few rare DNS lookup failures, resulting in errors when visiting pages or otherwise interacting with RBCommons. There have only been four so far, and are temporary. If you see a random error loading a page, please just try again. We know this failure has affected a number of other AWS customers as well. Tonight at 11PM PST, Amazon is scheduling some of our servers for a 6 hour maintenance window. This isn’t the first set of our servers to have undergone the mandatory maintenance, and we aren’t expecting any interruption to RBCommons during this time. However, we may be running at reduced capacity for about 20-30 minutes. We will be monitoring things closely. If you are repeatedly hitting problems with RBCommons, please contact us! We’ll post further updates if there’s anything to report. Announcing unlimited repositories, PDF document review, and 30-day trials! We’re very happy to announce some exciting improvements to the plans offered on RBCommons. We’ve removed the restrictions on the number of repositories your team can set up. You can now add as many repositories s you need without hitting a limit, and at no additional cost. Add all your Git repositories, your forks, open source projects you contribute to, or whatever you like. This applies to all plans from Starter to Enterprise. If you’re running on the old Micro 2012 or Small 2012 plans, you’ll need to upgrade in order to add unlimited repositories. We’ve also introduced support for reviewing PDF documents. Simply drag-and-drop a PDF file into your review request and wait for the PDF to be processed. Reviewers will be able to read through the PDF and comment on any section, just like they can already do with code and images today. This feature is available on Medium and higher plans. If you’re on a smaller plan, you can upgrade to take advantage of PDF review by changing your plan in your Team Administration page. If you’re interested in trying out PDF review first, contact us and we will temporarily enable it for your team. For the new teams out there, we’ve increased our trial period from 14 days to 30. This should give you more time to get set up and comfortable with RBCommons. If you already have a trial subscription, we’ve already gone back and increased your trial to 30 days. You should have received an e-mail from us already. If not, please let us know. We’re so excited to announce the all-new RBCommons 2.0. This is a major update that improves the service in so many ways that we won’t be able to fit it into one post. It’s faster, more reliable, easier to use, and full of polish. Let’s go over a few of the new features. The first thing you’ll see in the new diff viewer is a new file index. At a glance, you’ll see not only what files were changed, but the complexity of the changes. The ring icons beside each file show the proportions of inserted lines, deleted lines, and replaced lines. The thickness of the ring shows how much of the file has been modified. In most diff viewers, indentation-only changes look just like any other changes. You have to spend time checking to make sure that the content didn’t actually change along with the indentation. Not here! Now, indentation-only changes are shown with little markers, which show exactly how many spaces or tabs were used. You won’t have to spend any time looking at whether the text in the line has changed. You’ll know at a glance. We’ve also improved the quality of interdiffs (especially when dealing with merges), made moved line detection much smarter, and added an easy-to-use revision selector to quickly jump between diff revisions and interdiffs without reloading the page. We’ve completely rewritten the New Review request page, making it simpler to upload your diff and check it for errors. We’ve also gone further and added one-click posting of committed changes for review. 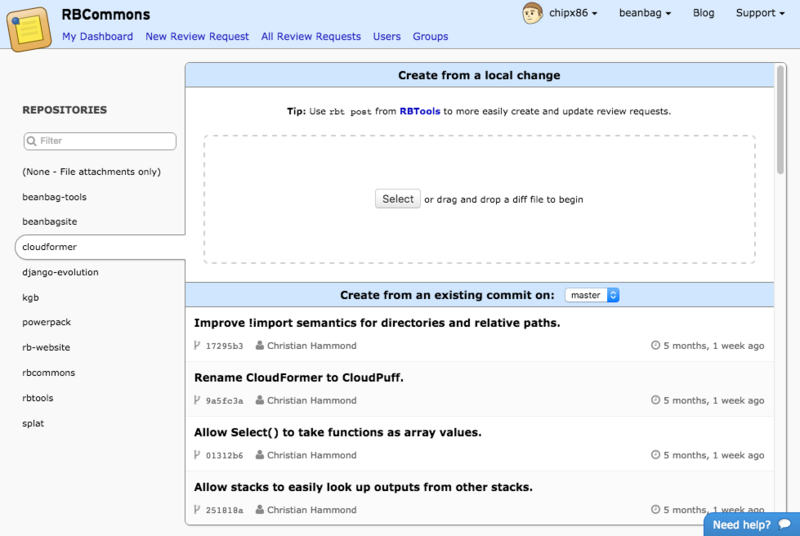 Simply select a branch, browse through your commits, and click to post. In seconds, it’ll be up and ready for review. When you’re working on large changes with several iterations, it’s important to know exactly what changed. We’ve always provided change histories, but they were pretty basic. Now, they’re anything but. We cleaned up the dashboard navigation and layout to help you jump between your incoming and outgoing review requests. The sidebar is less cluttered and confusing, and actually useful. We’ve also addressed two of our most-requested features: Issue counts in the dashboard, and batch closing of review requests. The Ship It column now shows the number of open issues filed against a review request, if any. These always take precedence over any Ship Its, helping you know at a glance if there’s any feedback you need to address. The all-new “Select Rows” column in the dashboard lets you select multiple review requests and close them in one go. It’s very useful when trying to clean up your dashboard if you’ve gotten behind in closing review requests, or if a former teammate leaves. Simply click the pencil in the top-right of the dashboard to add this column, and drag it where you want it. In the coming weeks, we’ll go into more detail on some of the more useful additions in this release, including tips and tricks on how to get the most out of RBCommons 2.0. This was a pretty major release, so if you have any issues, please contact us immediately so we can resolve them!